Welcome to our 28th episode in our newer podcast series where we cover everything related to investing in tax-delinquent real estate. In other words, we focus on properties where the owners have not paid the property taxes. As a husband and wife investing team, we’ve done nearly 3,500 deals – in land and houses – with little competition and big profits. And we want to share what we know with you. In today’s episode, we’re covering something a bit different – we’re talking with best-selling author and business expert Mike Michalowicz all about business building, which is crucial for real estate investing, because after all – it is a business. And when you are in business, you need to follow certain principles and strategies to continue to grow your business, which we’ll cover today. And, of course, in a business, you aim to not only make money – but keep that money – so we’ll touch on that as well. Mike is so super smart and we are thrilled he’s joining us and providing tons of amazing business-building info – you will be too! This will change the way you think about your REI business. Intro: Are you ready to transform your financial future? Here is your chance to see inside the mindset of self-made millionaires Jack and Michelle Bosch, as they pull back the curtain on secrets that can make you rich. Discover how everyday people are breaking the norms and building empires from the ground up, using little known yet proven and time testing wealth building real estate strategies. 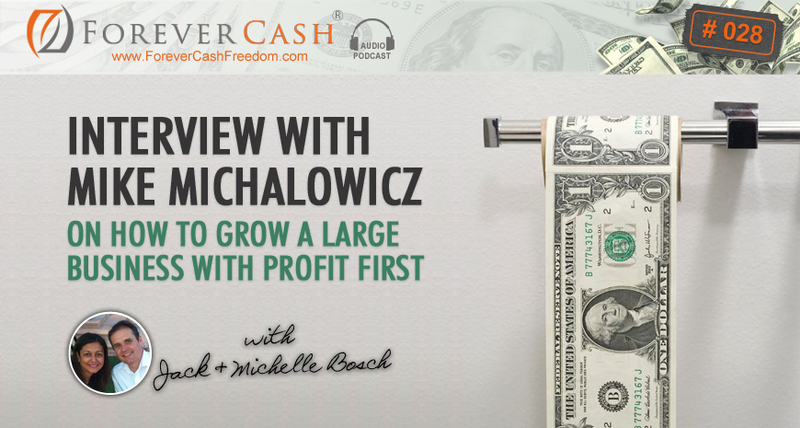 It’s my pleasure to welcome you to the forevercash.com podcast, and introduce you to our hosts, serial entrepreneurs, investors, educators, and bestselling authors, Jack and Michelle Bosch, strap yourself in for the ride of your life. Michelle: This is Michelle Bosch. Jack: And Jack Bosch, and welcome to the Forever Cash Real Estate podcast. Today we are going to talk less about real estate and more about business building. Guys first of all any business even real estate is a business, I mean a lot of people look at real estate as a way to just make some money. But any moment that you engage in something where you have the purpose of making some money you are in business. And when you are in business, you need to follow certain principles; you need to follow certain rules, certain strategies. And you need to make sure that not only do you make money, but number two that you keep money; we are going to talk about that. And also that if you have growth plans that you can grow your business in a way that it becomes that premier business in your niche if that’s what you desire to do. And we have an expert on the subject, I’m all giddy, I’m all super excited about that because we have an expert on both of these subjects. And we have here with us, bestselling author of not one, not two, but three books, Mr. Mike Michalowicz, is that — did I pronounce it right Mike? Mike: Oh, you nailed it — you nailed it Jack, it’s nice to be here. Michelle: Now I’m still star struck. Mike: I love that Michelle, I love it. Jack: So Mike wrote three books and perhaps even more, but that’s the three I have read. One of them is “The Toilet Paper Entrepreneur,” the second one was “The Pumpkin Plan,” which I absolutely love, and the third one was “Profit First,” which is your newest book right is that correct? Jack: And so I read all three of them actually an audio I read — I listen to “The Toilet Paper Entrepreneur,” I read both “The Pumpkin Plan” and “The Profit First” as a physical book. And I love them because you look — Mike really looks at business in a completely different way, and not only did you write books, you also obviously have a business background. And perhaps we get started with this way, but before we get started, I want to just let everyone know again if you are listening to this podcast, we have podcast notes, we have the transcript, and we have any links and everything that we mentioned here. You can access all of that in our podcast page which is under forevercash.com/podcast. So with that let’s get started, Mike let me turn the microphone over to you first and just perhaps you want to give us a quick introduction about, a little bit of your background, where you came from, and how all this all came together that we basically hear together today. Mike: Yeah, sure, so I’m an entrepreneur and not by upbringing, but I fell into it so after school where all my friends and everyone was seeking a job and I was too. I couldn’t get one, and this is back in the early ‘90s, and I just basically fell into becoming an entrepreneur. I never intended it, I never desired to do it, and I fell in love with it. It was terrifying in the beginning, but ultimately we built a small tech service company, we were installing computer networks and different technology. And I was able to sell that company, and then built a subsequent business, which was in computer crime investigation. And that business hit it because — well, I thought initially because I was so smart and was able to grow a company, but really the timing was great, the Enron trial broke right as I was building my company and we got engaged on that case. And my little local business took off and ultimately within three years it was quickly, but ultimately sold to a Fortune 500. And then I became an angel investor because I thought I knew it all, clearly I had built and sold two companies now, one to private equity, one to a Fortune 500, clearly I thought I had all the answers, ends up I didn’t, not close. And I started about 10 companies though an angle fund that I self-funded and that company subsequently tanked. All these little business I started up weren’t working out. And I woke into the fact that my understanding or my perspective of business was wrong. Just because things had worked in the beginning doesn’t mean it was the right thing, that luck had played a lot into some of the successes I had, right time right place by chance. So I started investigating all these principles I believed about business, and I had been taught about business, and started challenging them saying is it really true or is there something that’s missing here. And I started writing about it mostly for myself, and as I was writing I realized, well I’m actually starting to write something that should be a book. And I wrote my first book, you mentioned “The Toilet Paper Entrepreneur,” that was I think 2008 that came out. And knock on word that book hit it, it’s now sold over 100,000 copies. It’s born a career as an author and that’s what I do, I write books that challenge the business paradigms, beliefs that we have. Jack: Wonderful and you certainly do particularly when I read “The Pumpkin Plan” that one rocked my world quite a bit, because as — I don’t know if you want to take it from here. Jack: And made us think that we are geniuses. Michelle: And there was a little bit of smartness there, and that we recognized that we couldn’t within land, just go after every price range of property out there, but then we had to look for a specific type of property that fit our box, that became our single focus. And that’s why we were able to basically ride that wave and do very, very well. But yeah, just like you mentioned it was a lot of things in our favor that went to make — to create that success. But “The Pumpkin Plan” struck big particularly when we started also adding our educational business to it. And within the educational business all kinds of different tentacles, because what I love about The Pumpkin Plan is I just liked the first 18 pages just like — I was like I couldn’t — I mean I couldn’t stop reading the entire book, but after the first 18 pages I was like I would put the book down, I was like oh my god. We need to change the way we are doing things. And perhaps you want to explain a little bit the premise behind it and what it really is all about. Michelle: Yeah, the simplifying to multiply. Mike: Right, oh that’s a good summary of it. Most businesses the struggle they have is they — every opportunity, every new prospect that comes in the door is unexpected — has unexpected requirements. So we don’t know what to anticipate, the one real estate deal that comes in and requires some kind of environmental mediation. And the next one comes in, and there’s a lean against the property. Those are totally two different dynamics. And I don’t know much about property, but I suspect if you go into any property just randomly, that the perimeters around making the deal work vary so much that you’re learning constantly. Well, to start a business in the very early stages, we don’t know what we don’t know, so that kind of exploratory phase is necessary. You got to try a few deals here and there and see what’s working. But the key and this what I write about “The Pumpkin Plan” is to — if you want to grow, the only way to grow is by having predictability. When an opportunity comes in, that you know what you are going to be doing for the opportunity, and how are you are going to be handling it and there’s consistency. Because when you know what’s coming in, when you know what to expect, you can prepare for it. You can replicate it; you can do it over and over again. So in “The Pumpkin Plan” the process I explain is to evaluate your existing customer base, pick the ones that you enjoy working for the most or are the most profitable for you, the ones you can extract the most value from. And then replicate those customers and have the courage, and it is the courage to get rid of your weak customers, the one that don’t fit that particular niche you’ve identified. The riches are in the niche specialization, it’s about simplifying, doing less things for smaller scope of people, which ironically broadens your opportunity and makes you grow explosively. Jack: I love that and that’s why I said like we actually — so we like to refer to that as simplify to multiply now. So unconsciously or without really knowing or Michelle was a little bit off, just the hunch we did that the right way, for several years. But then the typical serial entrepreneur comes in right, and the serial entrepreneur gets bored with what they are doing already even though it’s doing well, going well and starting to figure out something else, and something else, and something else. And soon enough you’re spread too thin and you are not accomplishing anything in any of the areas. Mike: Yeah, that’s so true and that becomes a trap, and there’s a way out of that right? So just to reiterate from my own experience what you are talking about is as my businesses started to become successful, I started to go into routine. So I was doing the same thing, I was coming in doing a sale every day, or trying to do sales every day or do some service work. And it gets relatively boring replicating the same thing every day, and the excitement of starting a business isn’t there anymore. When you start a business all the possibilities lie in front you, it’s very exciting. Once you have an established business and it becomes a routine, it becomes a little bit of a slag; I mean I got to do the same thing day in day out. And the business isn’t progressing as quickly as I want and so these entrepreneurs, serial entrepreneurs, we jump in and we start something different. Well, there’s two things, first of all the definition of serial entrepreneur has a positive connotation. So we feel embodied by it, if I say I’m a serial entrepreneur I’m better than a typical entrepreneur, because I do this over and over again. So we associate a positive association, which moves us in that direction. The other thing though is we don’t apply that desire to do something new within our established business. So what I tell people is first of all associate serial with the inability to be successful. If you thought — of course I’m serial entrepreneur and you see that definition, then I can’t be successful at anything. Now you won’t want to be associated with that term anymore and you’ll stay focused where you are. The second thing is when you feel that compulsion to do something new, that isn’t a calling to start a new business, it’s to discover something new about your business to dive deeper somewhere in your existing business, and find a better way of doing it. Make your business, improving your business radically, that’s where the greatest success comes from, not from starting something new all the time. Jack: And I love that, I love particularly again if I want to go back to the first part of your “Pumpkin Plan,” when you tell the story of the actual, how the name of the book came about, that you literally learned from the people building the price pumpkin. And I repeat the story now all the time to everyone and every chance I have because it struck me so hard that literally the way to grow the biggest pumpkin out there is to basically look at which pumpkin has the biggest potential, and then chop off all the other ones. Jack: Here we go, you know German. Mike: Yeah, you are totally, totally right. What happens is — the vast majority of pumpkin farmers out there are ordinary farmers. So Jack you or I could go down any country road anywhere in the world, and as we look around we will only see ordinary pumpkin farms. And when you see those ordinary farms, the ones we go to for Halloweens so forth, you will never see a class of pumpkin miraculously growing out of an ordinary farm. What I learned was ordinary growing processes that play into the quantity game, more pumpkins is better, actually prohibits colossal growth. There’s a small fraction of pumpkin farmers, colossal pumpkin farmers. The kids they know, by the way call it the lords of the gourds. But hey, that voice was hysteric, but there’s a small fraction of these colossal pumpkin farmers, and what they do is instead of planting seeds over a massive farm trying to play in the quantity game, they play in the inequality game. They are very selective of the seeds they use, once that best match the soil content the climates that they live in. Then as the sprouts are growing they actually start killing off the small weak sprouts and focus on the strongest. And then all the energy, all the nutrients, all the water, all their time as a farmer gets focused on that best pumpkin. And it starts responding with explosive growth. But once I understood, and I spent a year studying pumpkin farmers, once I understood the pumpkin farming mentality and how to grow something colossal, I came to realize this translates directly in the entrepreneurship. Most entrepreneurs are in a quantity game, they are spreading themselves, and their resources way thin, and that actually prohibits explosive growth. Colossal entrepreneurs on the other hand focus their time energy on a very specific opportunity, they keep it extremely narrow, and they put all their resources into it, and that responds with explosive growth. Michelle: Yeah, I actually got exposed to a concept called 10X growth and mindset. And so it is very comparable to what you are describing, where if you are looking for two times growth basically quantity type of growth, you are having to bring all your existing resources, skills, everything to achieve that two times growth. But when you are looking at a 10X growth, which would be the giant pumpkin yeah, so you really have to choose from your past and your present what of that is really pertinent to bring into the future, and bring into that 10X future growth. Jack: Jack, Jake, anything works, it’s not my real name anyway, so don’t worry. Mike: Is it Joachim (German pronunciation)? Jack: It is Joachim yes, very good so yeah, but I go by Jack so don’t worry that’s all good. Mike: So well it should be good. So the thing is entrepreneurs to get our businesses started, we have to do everything. The more things we can do the better. So when I’m starting my business I have to do the accounting, I have to do the sales, I have to deliver the product or service; I have to run the office, because there’s no any other resources. The problem is it embolden us as entrepreneurs to believe that we can do anything well. So we start getting this mentality and saying well I can’t hire someone because they’ll never do as well as I can. Which is total nonsense by the way, but we believe it because we’ve proven it in the early stages by doing it ourselves. The key to colossal growth is to change the way we behave as owners, no way can we do everything. Our job at the next stage is to identify the few things that we personally are good at. Hire people around us to do the parts where we are weak, and then systematize it so that it’s done consistently and repeatedly well. The second part we are talking about on this entire conversation is, and do it for a very narrow scope of customers. Very specific set, so you become extremely efficient at delivering your offering to them. Michelle: Like a structure rhythm of success. Jack: Into that structure and so — and to that point, now I want to basically switch it over right now to the other side of the equation, exactly how to do that for a specific market segment. In your book you bring a lot of really amazing success examples, one of them that stood out to me was the airline that really figured out how to serve their customers such like in a way nobody else does, and ever since they’re full all the time. Can you speak to that — almost like to that select client assessment or selection processing of how you — not just select the right customers. But how do you select the right offering to the customers that really moves their needle and makes them into like raving fans? Mike: Yeah, so in the book I talk about a thing called the client assessment. And basically it says a lot more detail in “The Pumpkin Plan” that I’m going to give you now, but I’ll give you the two key factors. First you need to sort your clients out by the revenue they currently generate for your organization. And the reason this is important is the clients who are paying you more, particularly if they buy from you repeatedly are demonstrating through their behavior that they value you. I always say that people speak the truth not through words, but though wallets. It’s the action of the spend that’s says yes I like what you do. Unfortunately entrepreneurs will get feedback from friends or clients or prospects and say yeah, I love your service, you are fantastic and they believe that that’s an engaged customer or prospect, when it’s really not, it’s their actions. Or is it like, “Oh my god. I can’t stand these people. They are horrible human beings. I just need their money to survive.” If you feel negative about a customer, you cannot provide your best service. Think about your customers right now. If you have one you love, they are the first ones that gets the call in the morning. They are the first ones you service. If you used to do something for a customer you hate, like let’s push off to the end of the day, we naturally start filtering out and catering to these people we love. So in this assessment, sort out the ones who pay you the most, and you like the most. So sometimes your number one customer generates most revenue, you can’t stand them, they are not your true number one. Maybe they are a little bit down that list. Then once you identify your best customers, those are the customers you want to clump. And if you think, right now Jake, oh my god that’s my son, I don’t know—I have a picture of my son on my desktop so I keep calling you. Mike: Yeah I’m going to remove the picture my son. But Jack, if you can think of your best customer right now, that customer, if you had ten of them, I mean wouldn’t that change your business forever? I’m sure Michelle, you share this business together, you know who that customer is. If you have ten of them or twenty of them, wouldn’t that change your business forever? Well, that’s our objective. So what we do here is once you identify your best customers, you ask them and I found there’s ultimately three key questions to ask them, to clone them. First question is this: ask your best customer Jack, what am I doing right? What am I doing right? And your customer will say, “You are very responsive, you provide tons of detail,” whatever they tell you, I’m here to tell you what they are saying is not in fact what you are doing right. What they are telling you is what they observe, what they notice. So I ask my best customer what am I doing right. And he came back to me and said you know mike, “One thing you do really well is you are responsive. You get back to us quickly.” What that meant to me is he notices how quickly I get back to him, and if I want to really cater for him, I’ll find ways to respond even faster. So when your customer tells you what you are doing right, they are telling you actually what you need to improve and if you do improve it, they will absolutely notice, because they are judging your service quality, their experience based on that factor. Second is—one of the questions to ask is, what am I doing wrong? Here’s the way to ask it. If Michelle, if I went to you and said, “Hey what don’t you like about me?” You will never tell the truth to my face. It’s socially inappropriate. But if you and Jack are having a conversation off the air without me, you will say he’s way hyper, the guy’s a little crazy.” Whatever, you will be much more candid about me than if I was in the room. Well this is true with our customers too. So when you go to your best customers and ask what you are doing wrong, they won’t tell you the truth, but if you ask what’s wrong with my industry, now it’s the person outside the room and they will give you a true perspective on what’s wrong on the industry, which by the way is what you also need to improve. The real estate education industry, I’ve worked with other folks there and what I don’t like is that, every time I buy something, it’s never the first solution. I always have to buy more. I feel trapped in a perpetual buying situation. Michelle: Kind of an ascension model. Mike: Yes the ascension model. Then that first rate means the customer, and I’m not saying that’s true. Jack: That is true. I mean that’s something that we have identified actually as one of the biggest constraints along with some other ones by actually applying exactly what you are talking about. Where did we hear about it? In your book. Mike: There you go. If you fix this, meaning you resolve the ascension model and find a new way to build a profitable business, but that’s no longer there, customers will flock to you. So if you find out what’s wrong in your industry and you provide the solution, that’s the gateway to success. And the third and final question, and this is more in the book, but the third and final key question is to find your client’s vendor network. And this is what I mean: Ask your best customer or customers what other vendors besides yourself they work with. Like “Who’s the UPS? Do you use UPS? What do you use for shipping? What do you use for your office cleaning?” like every vendor they have. And they’ll look at you and say well why do you care about my other vendors? And the response is this, if I know the other vendors that are supporting you and we are collectively supporting you, maybe we can collaborate and congregate and serve you collectively better. If I know who your internet company is, and I’m providing you services via the internet, training tools and so forth, it would be nice to know them and perhaps when we design new trainings we can make it load more efficiently, or do stuff that works with your internet provider. So you are now serving your best customer even better. They’ll love it. You are catering to them. None of your competitors ever ask a question like that, who’s your other vendors. So they’ll be blown away that you care that much. But there’s a golden opportunity in here. When you get to know these other vendors, they probably have more clients just like the one client that you mutually share. You come up and say, “Hey we share a great client,” and you say their name, “Oh yeah we love doing business with them.” Then you say, “I want to collaborate with you, see how we can serve him better, and by the way may be we’ve other opportunities to work together.” It is the ultimate gateway to referrals through the vendor well, I call it. Jack: Wonderful. I mean that was just a fountain of applicable knowledge for anyone who’s in a B2B, B2C business and has repeating customers. I absolutely love it. I want to tie it back right now into a lot that we do. Our students are real estate investors or people who want to get into real estate. I want to make a case that for example in our land flipping business, we also have repeat customers that come—now on the buying side we rarely buy more than one or two properties from the same person, but on the selling side, we do have repeat customers. And if you are in the housing area you have a lot of repeat customers. So I just want to translate that from a more—if the audience thinks, “Well how does that apply to me.” Well it applies to you, because if you build up what we call a buyer’s list typically, if you cater to that buyers list in a way that they just love you even more, I mean on the contrary, if you ask them what they effectively want, they can, you can cater to them much better by providing the product that they are looking for just as one simple example of that. Am I understanding that right? Could that be translated in that way for our market? Mike: Absolutely. Even if you are on a market that only gets one buyer a lifetime, and there’s a market that experiences that. It’s called funeral homes. I actually spoke at an event of funeral home directors, and their situation of course is someone passes away, that only happens once and that customer never comes around again. How do you get repeat customers, and how do you learn who your best customer is. In cases like where you have very infrequent repeat buyers, what happens is you will find among your seller customers there’s probably a common demographic or what they call psychographic. Demographic is their physical make up, male, female, age. Psychographic is their thought patterns. And you need to investigate what the commonalities are among your people. Do you do well with expats? Do you do well in the gay community? Do you do well with seniors? What is the exact community that you are resonating with? Then you concentrate your efforts there. The expat community has a specialized community, newlyweds with a child have a community hangout, I’m not saying they physically get to together, but they maybe in a mom’s club, or they may be reading certain magazines which is different than the gay community. But you got to understand who your best buying community is, and then you invest your time in concentrating where they congregate. And if they see you present there on a recurring basis, you become the trusted authority for your industry, and you get the business. Jack: Absolutely. I want to switch gears now if I may, and that is to the other book that you’ve written. I love The Pumpkin Plan. Everyone should go to Amazon and buy it. It’s a great book. By the way I want to actually applaud you for actually reading your own books as audio books too. Jack: I’m in the gym and I have to be careful not to laugh out loud while I’m there when people look at me as weird, because it’s just funny the way they are written and the way he talks. Mike: Yeah I do voice impersonations. Jack: Yeah. So I love that part. And I want now to switch a little bit gears to your last book which is Profit First. Profit First resonated with us for a different reason, because a few years ago I actually wrote a book too that’s called Forever Cash and became an Amazon number one best seller. And in that book we basically, I think our financial philosophies are very much the same too a degree, and we will talk about that in a second that we also recommend people have different accounts to protect themselves from themselves from– we might talk about that in a moment, but for different reasons. But you apply it to business. We apply to almost like the personal finance, but I think the philosophies are very, very closely aligned which makes me more excited to have you here on the call. So how about you tell us a little bit more about the Profit First and the premises, how did it came about and a few things about that, because again it’s a different way of looking at your business. Instead of doing what everyone does, you are like turning the world upside down and focusing on what really matters. If that’s the one thing that’s stood out for me is that you really focus on what matters which is profit versus revenue. Even in the organization we both belong to, entrepreneurs organization, everyone talks about revenue, nobody talks about profit. Jack: And it really doesn’t matter what you are making in revenue as long as you make—what matters is what you take home. So I’m going to let you talk about that right now. Mike: I love EO. I’ve been a member, I’m going on my 15th year. And I remember walking to the first meeting; I’m in the New Jersey chapter. They had just started the organization maybe a few years prior, and when I walked in there was maybe 20, 30 people in the room, all entrepreneurs. And it was a chest pounding club about revenue, and I bought into it. You have a million dollars in revenue to be there in the first place, everyone there is doing a million, and then one guy is like I’m doing four, and a woman says I’m doing six and someone’s like I’m doing ten. And that was the big winner in the room for that day. Well that failed miserably, and it shook me to my core. I mean, I was a financial train wreck. I was suffering from depression because of what damage I had done to my family, losing all my money that I made selling my businesses. Jack: I think you mentioned in one of your books that you lost like almost a million dollars? Mike: Oh yeah, plus, like in two years. It’s funny. People are like, “Oh so you can really teach me to make money?” I said, “Yeah but I’m really going to teach you how to lose money.” So if you want to master that, I’ve got like a master course. It was a wakeup call for me saying, “What’s wrong with me.” And I started—I came across a study, and this blew me away. There was a study conducted, in part by the SBA and I think some other organizations participated too. It identifies that there are 28 million small businesses in the US. And a small business is a company according to the SBA, a company that does $25 million in revenue or less. I suspect that’s your business, I suspect that that’s the vast majority of EO’s members, it’s definitely my businesses. And then the study went on to say and 83% of the businesses, that’s roughly 23 million businesses, 83% of these businesses are surviving check by check. They are on the vast of going bankrupt. If they don’t get a deposit the next two weeks, they are not going to have enough money to cover next week’s payroll. They don’t get a deposit in the next month, they are out of business. They got to shut the doors. I’m like how can so many businesses, so many entrepreneurs be smart enough to start a business, attract customers and prospects, deliver our services, do all those great things we do, but a little piece of our brain is missing that can’t figure out profit, like we can’t have money in our pockets, what’s wrong with us? Michelle: And you take that as this is how things are. We are both, the result of business school both Jack and myself. So you take that as this is how it should be, and you take for granted versus thinking about okay what are either as a business or if it’s personal finance, what don’t my money rules, what type of activities do I need to engage such that produce X amount of profit because I’m not willing to work for anything below that. And what needs to be trimmed off on a regular basis in order to produce that and so on and so forth. Mike: The formula logically makes sense. You have to sell of course, you have to pay your bills of course, and whatever is left over is profit. So logically it makes sense. The problem is behaviorally, the way we operate as humans, it doesn’t makes sense whatsoever, because whatever comes last in our lives, doesn’t happen at all. For example, exercise. If Jack, Michelle and even me, if the three of us say we are going to start working out and we all say, “Let’s just do it at the end of the day, we’ll do it right before bedtime,” the chances are when that time rolls around, we’ll be too tired, we will say, “I’ve got other things to do. Something came up at work.” There will be a million excuses. Conversely, if the three of us say, you know the second we wake up in the morning, at 6:30 in the morning, we are all going to get together and we are going to hit the gym, the chances of doing it increases like by 100 fold because there’s not obstacles in the way. Nothing’s come up, we are not tired, it’s the first thing you do. It’s human prepensely, whatever gets done first is what gets done. Whatever is assigned to become last, rarely if ever gets done. And that’s why only 17% of businesses ever show a profit and 83% never do. Jack: That’s the statistics. I love your example here about working out because for example that’s exactly the reality. It’s like if I don’t get up in the morning at six in the morning and be in the gym at 6:30, it doesn’t happen. If I let breakfast and other things come, even breakfast come into way first, by the time breakfast is done I will have a couple of cups of coffee, and talk to Michelle a little bit, I talk to our daughter, bring her to school. Already the first things come my way that will take me from that path of going to work our first, unless I literally not look at my phone, not look at my email before, which I’ve gotten better at. But yeah it’s exactly the point, if you don’t do it first, it doesn’t happen. If I do it first, hey I’m in great shape. Everything is good. Mike: Exactly. So here’s the formula I suggest in Profit First. It’s not sales minus expenses equals profits, it’s sales minus profits equals expenses. And what I mean by this Jack is that as you have sales you immediately take a predetermined percentage, 5%, 10, 15, 20% whatever it is, your profit percent and immediately take that money and hide it aside. So say $1,000 deposit comes in, you immediately take 20%, 200 bucks, you tuck it away in a bank that’s out of sight out of mind, you are taking your profits first now, and then you survive or you live off the remainder. Now there’s at least 1000 companies we have doing this. It’s hard to measure. We have 88 accountants and book keepers helping us support Profit First on a now global level. We are in Germany. That’s why I’m learning a few words in Deustch, because we are in Germany in Berlin and Munich as I have now learned. But what we are doing is when these companies take their profit first, their behavior, how they run their business changes. The core premise and this is important to know is called Parkinson’s law. Nothing to do with Parkinson’s disease. But Parkinson’s law there was this, I guess it is a biologist or a neuroscientist. He discovered that it’s the human propensity to adjust our demand for something based upon its supply. Perfect place, sitting in front of you, I’ve never seen you brush your teeth; I presume when you put that toothpaste on your toothbrush, you put a long bead of toothpaste on. Michelle: Yeah I’m actually really generous. Mike: Much more generous. And if you pour water on it from the—it falls in—and it falls in the sink like, “Screw it. I’ve got more toothpaste I’m going go—this disgusting bacteria down there. I’m not going to touch that.” But now when that toothpaste tube is almost empty, now the whole game changes. We will do anything to squeeze just a little more toothpaste down there. We’ll bite on the edge of that toothpaste tube. And one little droplet of toothpaste or one bristle hair is now enough to brush our teeth. And if toothpaste falls in the sink this time, well now we go diving in after it, bacteria and all, and scoop it back out so we can brush our teeth. What that is, is Parkinson’s Law. The less toothpaste, the more innovative we become. We find ways to squeeze more toothpaste out, bending, twisting, and so forth. We become more frugal, so our behavior changes based upon the supply. That’s Parkinson’s law. Then we say, “Okay, I just got to kind of bend and twist a little bit more until there’s more money in there.” So our behavior changes to become more innovative finding more efficient ways to run our business than ever before and more frugal. We are much more selective in where we spend our money. Michelle: Yeah I totally agree. And in the beginning it might seem like it’s a contractionary method, but it really is expansionary because like you said, it really makes you think on how can you innovate, how can you do things much more efficient and make basically more with less? Jack: And I love what you said, I’m paraphrasing from somewhere in the Profit First book, where you said like the worst thing that you can have to start a business is money. Mike: Yeah. Isn’t that funny? And the challenge I get from people and when I do presentations—actually I’m doing a tour through EO Canada. I’m going to five or six chapters up there next month, and I know what’s coming. They are going to say, “I hear this, take your profit first, I get it, but I won’t have enough money to grow my business. I’m using every dollar to grow. It’s going to stop or inhibit my growth.” And the reality is it’s the opposite. Money allows us to do the easy route. So when we take money and we invest it or whatever the friendly terms are we use, it dumbs us down. We don’t use our minds to find a better way of doing things, because we use the common way. Money allows us to do the common thing. So when there’s no money there, now we have to find innovative ways. How do I get the same results with less money? It forces me to think differently. And the most innovative companies are always the most successful companies. So this actually reverse engineers your way into innovations which facilitates the fastest growth. Jack: And you know, if I just may summarize or like my take to that, why I really like that is that both– all of our business were pretty much started at bootstrapping particularly our first business. Then the second one we had some money to start it up with, but we still only allocated this small amount to it. But what it really applies to is to a lot of our customers. Because in our educational business here, a lot of our students are in a position where they are looking at us and they are saying like, “You guys now kind of like, “have it made.” You guys are running a big business and so on.” But it wasn’t always like that. We had to start with $3,500. And we had to figure out the way to make those $3,500 last, and turn it into deals and turn it into things like that, and that’s exactly where most of our students are today. So I’m really glad you are saying that because it just illustrates that actually this is the better way to start a business, because if you have a lot of money to spend, you’re just going to squander it on a lot of things. Mike: It’s a better way to start and I argue it is a better way to stay with it. So our company, one of the companies I own, I own a few businesses, but one is called Profit First Professionals is this organization. We have intention, we follow our own medicine. So we take a substantial amount of money and put it aside as profit. And it’s forced us to be frugal and innovative, and we are experiencing the fastest growth as a result. So yes you are forced to do when you start because you still don’t have the money in the first place. But as the money starts flowing in, the key is to stay that way, to stay that small kind of business mentality. It gives you a bigger advantage over the big competitors. Michelle: And for us, for example our students, and also how we started was identifying — after we had made a deal and profits came in basically what percentage to allocate for future growth to go in and flip more properties, what to keep in savings, or what to keep for future asset allocations so that we can go out there and actually purchase forever cash assets that would produce passive cash flow in the future. I totally see it now. Could you walk us through the core four healthy habits that you mentioned in the book? Jack: In the book you mentioned that. Mike: Yeah and this translates from the health industry. So in every book I like to do an analogy related to something that hopefully most people can connect with. What I discovered as I was writing Profit First or at least conceptualizing it is that financial fitness in our business is like personal fitness, our health, and our diets. So I started studying the diet industry and the nutritionist and so forth, and I found these four core principles that they use to help people become very healthy. The first one, and this one was actually the most impactful, was if you want to lose weight or control your choleric calories intake, the best mechanism to do this is to skip smaller plates. The plates in the American diet have literally doubled; it’s true for the European diet too, have doubled since it was nearly 200 years ago. So here in the states, George Washington was literally eating off what we use now as a desert plate to serve a piece of cake. That was what he was using for entrées, for his main meal. And as our plate has gotten bigger, our behavior hasn’t changed. We fill up our plate and then as mom said, we eat everything that’s on the plate. We clean it off. So plate size is dictating portions and then we eat everything. Step one, get smaller plates. Now how this translates into business is instead of having one account that’s one big serving tray of a plate, if you will, where all the money goes in and all the money comes out, set up multiple small plates. Have one account set up already for profit like we discussed. Have one set for owner’s pay. You are the most important employee in the business. You are the owner. We want to be allocating, pre-allocating money to pay you, pre-allocate money to tax. When your tax bill comes due, you started your business for financial freedom, have the business pay your taxes for you. So have the business reserve your tax liabilities in advance. Have another bank account for operating expenses. And those operating expenses are what you run your business off. Now as deposits come in, you allocate money into these small plates. So $1,000 doesn’t sit on $1,000 serving tray anymore, $1,000, $200 goes to profit, maybe $150 bucks gets reserved for tax, may 400 gets reserved to pay the owner and that means $250 is left for operating expenses. So you don’t have $1,000 to run your business. You have $250 to run your business. It changes your perception. So that’s principle one. Principle two, is to eat your vegetables first. The sequence that we eat food, actually determines our health more than anything. If you ate only the dessert, that triple layer chocolate cake, first you will have very unhealthy diet. If you start off with some asparagus and Brussels sprouts, it will fill up some stomach space, you will get the nutrients you need and when it comes to that dessert and the other things you are going to eat, you’ll actually eat a smaller apportionment, it’ll balance your meal. Well, in business, the first thing we need to do is the vegetables. That’s our profit. So the money gets allocated out to these accounts, and the profit gets removed from the business first. It’s your vegetable and you’ll adjust accordingly and apportion appropriately for everything else afterwards. Principle three, remove temptations. If you like cookies don’t have cookies in your house. If you are addicted to soda, don’t have soda in the house. If you do will-power only last so long before you are like, “Oh my God, I got to have those cookies.” Remove it from visibility. Same thing with your profit. As you start accumulating profit, immediately move that money to another bank that you don’t log into, you don’t even have access to. Make it inconvenient. And then when you go across tough financial times and you’re still well, your business is still fluctuating and revenue isn’t as strong as you thought. You don’t have enough money to pay bills, now you can’t “easily” just grab it from your profit account which will defeat the entire system. Now since that money is removed, you’re forced to find a way. And by the way in the system when you can’t pay your bills, that is your business screaming at you and shaking you, Jack, saying, “You can’t afford these bills Jack anymore.” Stop paying these, find a more efficient way. So remove temptations. And then final thing is frequency. In the diet industry, most people eat too infrequently. You should eat five meals a day, we eat less than that, five small meals a day. Well, I found there is a rhythm too in when it comes to financials. For most business, if we go through this accumulation of money and an allocation of assets to different accounts and pay bills at that time, if we do this twice a month, that’s easily the perfect rhythm. Now why this is so important is if we allow money to accumulate, don’t do anything with it for two weeks, and then allocate it out, what happens is we get to start seeing our cash flow. Money comes in, accumulates, then we allocate to different accounts, we pay the bills, we reserve profits, all that stuff, that account where the money accumulates goes back to zero, I call the income account. Now over the next two weeks the money accumulates again and then disperses out. Accumulates again, disperses out every two weeks, you start seeing the waves of cash flow. It is the easiest way to measure your cash flow and not have to use a cash flow report. Michelle: Yeah absolutely. Now what signs does a business need to be to start thinking about profit first? Mike: You literally can have $1 in revenue, a brand new company, because it is a percentage based system. Some people come to me and say, “I guess I have to have a sizeable company to do this.” I’m like, “No, no. You just need to start today because the sooner you start, the more likely you are going to make this an ongoing habit and be successful with it.” Literally if your business made $1 this year, $1 this year, 10% or 20% which should be ten or twenty cents, will go to your profit account and the remainder gets apportioned accordingly. So you can get started. The key though is not to wait. Many businesses say, “I’ll do this one day when I’m out of debt.” But the only way out of debt is to be profitable, so you got to start today. I’ll do it one day when I’m more financially disciplined, you’ve already proven you are not financially disciplined; this will get you there, there’s no excuse not to start today. Jack: I 100% agree with you, and it really goes very well along with what I said when I wrote my book about in the personal finance area like in the — how to become in a sense financially independent is what this book is about. It’s a process of actually we have five steps in there, they are very much mirror your steps there. And one of them is whenever you do make extra money, whenever you do whether it’s a real estate or any other way, you take that profit, and ideally since you already have a job, you take all the profit and put it into what we call a seed money account, which is basically a separate account that you have limited access to, you have no checks for. So I had to laugh when I read your book, because you basically said the exact same thing there. That you put it off to the side so that you don’t have to fall to the temptation and grab it, and then once that is big enough you can then use it to actually reinvest in other assets that provide more cash. And in that cash you don’t touch, you put it back in there and it’s a process we call the wealth wheel. But whether you do it in your personal life or in your business, what I do want — it just struck such a big cord with us, is the fact that profits are first, it’s not about revenue, it’s not about them. And I had a question but I think you pretty much answered it, the business shouldn’t wait until they are debt free, they literarily they should take profits even if they have debts, right? Mike: Yeah, that’s one thing; it gets a little controversial because people are like well, if I have debt I can’t be profitable I have to serve my debt. But here is the deal, debt is an expense that you’ve already incurred, but didn’t have enough money that time to pay, therefore it’s still due. The only way you can pay that is by being profitable. You have to make money in excess of your current expenses to pay back your past expenses. So you have to be profitable. Now here is the key, as that profit accumulates when it comes out as a disbursement, it goes to the servitude of debt; I call it the death to debt party. That money comes out your profit account and then whacks the debt and you do it in clumps we do quarterly profit distribution. So you do it once a quarter and you crush the debt with it. But you got to get this in place, then the beautiful thing is once your debts are eradicated, you have this profit system in place and established, now that next disbursement that comes out goes right into your pocket. Jack: Wonderful, well there is a whole bunch more things we can talk about, but we do probably want to wrap up right now. So one last question, some of these like really an entrepreneur that’s starting out and we talked about two concept one was the “Pumpkin Plan,” one more the “Profit First.” How do you combine the two when you are just starting out, is there any kind of — what do you focus on first on the right business, on the profit, how do you combine them? Michelle: Yeah, so well I do them simultaneously. Profit first you can get implemented on the basics starting today, like literally at the end of this interview we just did, whoever is listening could walk out the bank, set a few extra accounts and they are in business with profit first. There’s a lot of nuances and yes you should have a professional account and a bookkeeper helping you manage it on a day to day basis. But you can get started on the basics literally today, that’s what I start with. The perfect complement to it is the Pumpkin Plan strategy we talked about is in finding your niche. So now that you are allocating profit, now you have to pursue the most profitable customers, and that’s where the Pumpkin Plan comes in. The Pumpkin Plan is a long evolving strategy, and the book dictates how you do it over time. Profit First is a simple strategy you can implement today, have success with today, and the key of course is sticking with it every day. Michelle: Yeah and it’s — for us instead of finding — for our students would be finding the most profitable properties, or the most profitable market to be working in and so on and so forth. Jack: Make a decision on land or houses, and what niche within land, what price point and so on, so that you get to the biggest bang for your buck in other word. Well, wonderful I mean I’m loving this, I loved everything you said, I put my signature under everything, I approve of everything that was said not that my approval really matters. But you are the expert here in this matter. But I love it, now somebody — how can people hear more about you, obviously there’s the books, but how can they get in — if they want to get in touch with you, if they want to learn from you more, what can they do to take another step if they needed any kind of help? Mike: Yeah, I think all the resources you need in the starting point would be mikemichalowicz.com. Now I know that’s a doozy name to spell, it may be on the show links, but on Google I got a little trick. Type in Mike my first name, M-I-K-E and then type in M-I-C, so Mike Mic, you’ll see popped down on Google and then click on Mike the longest name you see, which should be Mike Michalowicz, and that will bring you to me. And I have free chapters from profit first, “Pumpkin Plan,” “Toilet Paper Entrepreneur.” I used to write for the wall street journal for years, I have all those articles up there for free, and they were very popular, so you can check out all that stuff. Michelle: There’s a question that I wish I would have been able to ask and that is what should business owners be doing quarterly, I know that we — like I said we are into quarterly rhythms, what should business owners be doing? Mike: I’ll tell you what to do on a quarterly basis; you do a profit distribution and a re-assignment of your percentages. So what happens is — again understand that profit first is a behavioral based system. Meaning we need to leverage our normal behavior. Our normal behavior we talked about Parkinson’s law earlier is spend what we see, but also we achieve momentum and significance out of reward. So when we reward ourselves, we feel a positive association with that, we’re encouraged to do more of the same. So most businesses only take their profit if there’s one at the year end. And that’s a mistake. Take your profit quarterly, so January, February, March is the first quarter and then May, June, July second quarter and so forth, September. When the quarter ends, the money that’s in your profit account take that money out, I don’t suggest taking all of it, I would reserve some. But take the money out and use it for you as the owner of the business as a reward to yourselves. Do not put it back in the business, do not use fancy terms like plough back or re-invest, that’s total-total nonsense and unwinds the system. The business has to survive on its own, but you must be as the risk taker of starting this business rewarded for that. Michelle: For that risk absolutely. Mike: Yeah, this is your reward so that comes out, go on vacation, go crazy with it, buy that thing you wanted, but reward yourself. The second thing is after you take your reward you’ll feel emboldened, empowered by your company because you’ve been definitely rewarded by it. Now you look at your percentages and say what can we do to further improve it. Maybe my profit I was taking was 10%, now I’m going to go to 11% or 12%. Maybe expenses were at 60%, now I’m going to drop down to 58%, adjust it. The key though is this, move slowly. I have had people call and say Mike I hear your system I love it, I want to go — I want to take 50% of all income and make it profit from day one. Well, that’s such an intense adjustment so fast, that could crush a business. Start small, a low percentage for profit and maybe pay and so forth. And over time build every quarter slowly, but very quickly within a year or two you’ll be one of the financially elite companies if you stick with this process to move forward every quarter. Michelle: Absolutely, yeah, thank you. Jack: For that extra bonus question here. With that I want to thank you very much. Mike: Oh Jack and Michelle to both of you, it’s a pleasure; Jack I’m sorry about calling you my son over and over again, I kind of adopted you. Jack: I’m good with that, I’m probably older than you are, but or I don’t know, it’s probably similar age, but we weren’t to disclose our ages right now. So with that I want to thank you everyone for being on our call, obviously if you want to review our — if you want to send a review to our podcast, you can always do that, just go to iTunes, look for Forever Cash Real Estate, or just forever cash, the podcast comes right up. You click on it and you can submit a review or just select how many stars you want give us. And download it and tell your friends about it. And also if you have questions you can always go to our Facebook page which is facebook.com/forevercashlife. So with that I want to close it out. Jack: You all have a wonderful-wonderful rest of the week, and next week we’ll have another podcast episode for you, bye-bye.